Luckily the recipes have been translated to allow us to use all-human ingredients...but not-so-luckily it's all in American. Over this side of the pond, we weigh our dry ingredients. Over there - you use cups. Wet ingredients are OK though (or so I thought) because we both use pints and fluid ounces. But wait - they're not the same!!! My new best friend explained that a US cup is 8 fluid ounces...whereas a UK cup is 10 fluid ounces. Looks like I'd better buy an American measuring cup. Back to the dry stuff. Can't be too hard to scoop out a cup of flour, can it? But apparently it can. 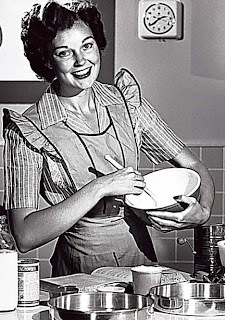 My new best friend says :" It's also important to realise that when an American recipe calls for "1 cup of flour", there is an assumption in how this is measured. Scooping out of a bag will compress the flour, and a cup can easily end up containing an extra quarter or even half an ounce, and this could make a big difference to the results. Instead, the "official" measuring technique is to stir the flour with a spoon to "aerate" it, then pour it into the measuring cup and level it off with a straight edge. Don't pat it down, or tap the cup on the workbench to level it off. However, this only applies to very powdery dry ingredients, like flour. Other ingredients, like rice, brown sugar or fats, should be packed firmly in the measuring cup to avoid air gaps." Even now I'm not ready to cook. Many recipes call for a "stick" of butter (although it seems even in America some of you prefer to buy your butter in "cubes", like the lower of these two! In the UK we don't buy butter in sticks. 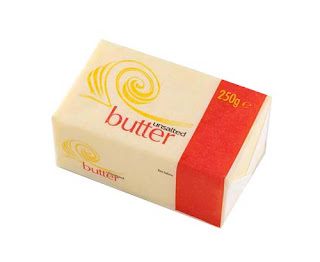 We buy butter in 250gm packs. 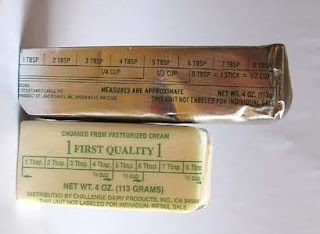 My new best friend says "You normally buy butter in packs of a pound, consisting of four sticks, and they're usually marked in quarters (sometimes in eighths), making it easy to measure off, say, 2oz of butter, or "half a stick"." Yet sometimes the recipe asks for "half a cup" of butter. What on earth do you do? Squash the butter in? 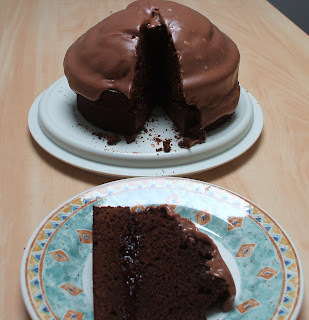 I know what I did...made an English recipe chocolate cake, cut in half horizontally and sandwiched with raspberry jam! The new part to me was the icing (USA = frosting?) I melted some chocolate (actually I burnt some chocolate to the bottom of the pan, went out and bought some more, then melted some chocolate) mixed in some raspberry jam (USA = jelly?) and some icing sugar (USA don't know what this is, the very fine powdery type) and a little water. Absolutely yummy! In the US jelly is clear and jam has the fruit in it. The sugar you mention is what I know as confectioner's sugar. As for measuring the butter you will find the amounts on the label the stick is wrapped with. Your cake sounds heavenly by the way! the cake was (still is!) nice! I didn't realize baking was so different in other countries. Seems perfectly normal to me but I can see how it would be confusing for you! My mom recently got a recipe from her Australian cousin and couldn't figure out the measurements and certain ingredients to save her life! This post was so entertaining! I'm glad you mucked through it to be rewarded with a lovely cake at the end. Neelix would be proud! How funny, good luck figuring it all out! Oh....lol.... the same...yet so different. Confectioner's sugar is also called powdered sugar here. 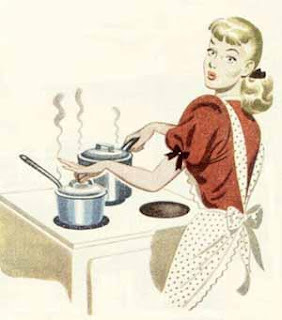 And, regarding flour, rather then stirring, you should generally shift it. At least when something requires eggs....we are all on the same page! LOL. I have a book that measures in cups and teaspoons but at least it's an old british book so I can still use it quite easily. At any rate: 1 stick=.25 lb=.5 cup. still seems puzzling to me ...but guess what I just found in the back of my cupboard? A jug I bought in Ikea, ages ago, and chucked in the back because it's got cup measures on it, and not UK pints! Problem solved, hopefully! Eh, it is puzzling. No two ways about it. Even beyond the whole conversion issue, the volume/mass thing is bizarre.